They were four little girls living in ramshackle trailers beside a lake in rural Indiana. They shared everything from dreams to measles to boyfriends to more dreams. As they grew up, everything in their lives changed--except their friendship. Through weddings and divorces, births and deaths, one terrible secret has kept them close despite all the anger, betrayal, and pain. Secrets are revealed and truths uncovered, but will their time together cement their lifelong friendship--or drive them apart forever? It's funny that I've always liked being needed, but at the same time I envy Vin and Andie and Suzanne because they're not. That sounded ugly, didn't it? I don't mean it that way, I really don't. I would just like the chance to be myself for a while. Whoever that is. Sometimes I think you have only one, but different people's chances come at different times. I don't believe a chance ends because something bad happens... because you get a crummy deal. You just have to hold your cards close to the vest sometimes and play conservatively until the luck of the draw comes your way again. It's been said that time heals all wounds, but sometimes friendship does, too. How could they return to this place that had deferred their dreams, broken their hearts, and made sinners of them all? How could they not? It was home. Friendship. Trust. Devotion. Growing up. This novel was such a heart warming story of the friendships between four very different women that share a common bond. Friendships that have endured through marriage, divorce, kids, illnesses and all of life's changes that can sometimes rock a person to the core. These women stand together united through it all. I have always been a sucker for a good story revolving around female friendships. I just love when writers can catch the ease in which women relate to each other. How we share our deepest secrets with the ones we trust the most. Tonsil Lake is the place where Andie, Suzanne, Jean and Vin grew up. They looked out for each other. They dealt with their family issues and problems together. Tonsil Lake was their home, until one day changed it all. The four women share a secret that is buried so deep, they rarely even talk about it but it's there. It's at the back of all of their minds as they go through life. This secret shapes the women and their lives. I thought the author did such a great job at creating the voices of these four women in their early 50's. This is not a book I would normally pick up but when I was requested by the author to do a review, something about the synopsis grabbed me and I'm so glad it did. Their is such a distinct voice for all these women that you as the reader come to know all of them as very different but friends all the same. Suzanne is the pretty one who always needs her skin care and makeup. 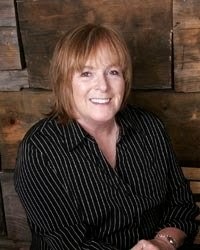 Jean is the cook who takes care of everyone's needs before her own. Andie is the hilarious one that you just can't help but love. Finally, Vin is the rock that holds them together. As a reader I am always delighted when a story can be told from all points of view, just like this one. I got to know each individual character and that means I got to love them, hate them, yell at them and cry with them. When the reader has an emotional attachment to the characters being portrayed, the story just gets that much better. 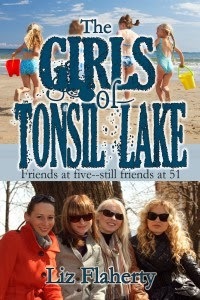 Told from all points of view, The Girls of Tonsil Lake was written with that intention. I believe the author wanted the reader to fall in love with all four women and I believe that goal was accomplished. At almost 250 pages this novel is a fast paced, short read. The story started moving right away even in the opening pages. I for one love when a novel takes off at the beginning. Although I love reading, if it takes awhile to get into a book, I quickly lose interest. I appreciate when the author can capture my attention from the very first pages. I would reccomend this book to all you romance, contemporary and chick lit lovers out there. A fresh, engaging and original treasure is found within this books pages. I was always daydreaming as a kid, about living in elegant places where other people made your bed and dusted your furniture, wearing clothes that screamed triumphantly, "Liz Claiborne, size two!" every time I put them on, and writing blockbuster novels. Instead, I live in a big old farmhouse back a dusty lane, where whoever is the last one out of bed makes it and no one bothers with dusting. My clothes mumble sheepishly, "J. C. Penney, buy a bigger size." And my novels aren't what you'd call blockbusters. What they are is stories about people like me and maybe like you, whose dreams have gone awry or simply withered up and died. It's my job as a writer to take care of those dreams, either by straightening out the old ones or finding new ones. Either way, I love it, and I'd love hearing how you feel about how I've done that job.